The three Lancashire hatcheries were all doing well. 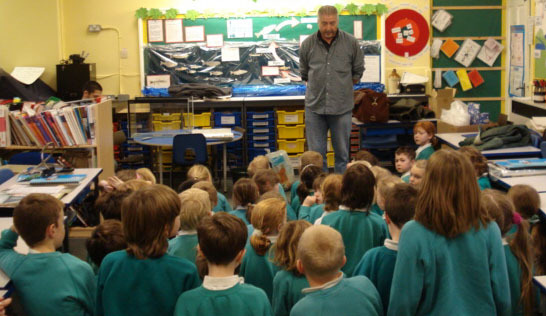 At Brabin’s and St Leonard’s schools the eggs had all hatched. The alevins were mainly keeping to the gravel with a very occasional venture to the top of the water by one fish. The tanks were still wrapped with the reflective insulation to keep them cool. 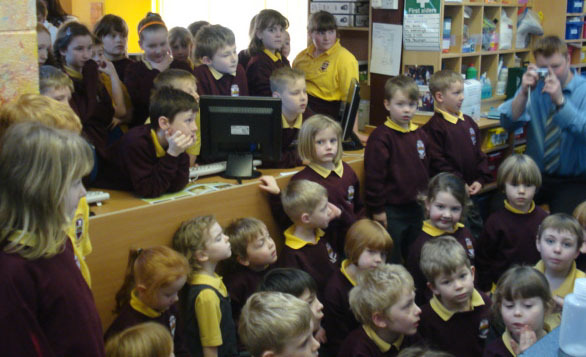 At St Leonard’s the tank is situated in the year 1 & 2 classroom but the whole school is taking an interest. The children had been fascinated to see the eyes of the fish through the translucent eggs. They noticed that their eyes got bigger and bigger before the alevins eventually hatched out. Which came first - the trout or the egg? That is the question the pupils of years 3 & 4 at Thorneyholme RC Primary School, Dunsop Bridge are pondering. In preparation for the Trout in the Classroom project they have produced this wonderful display. It shows the different stages that trout change through as they grow from an egg into a mature fish, which goes on to lay futher eggs. The text was produced as a factual writing element in their literacy lessons and they worked hard on their artwork too. (Click the picture to see a larger version). The trout or the egg - we will never know which was created first. Any attempt to answer such eternal questions always goes around in circles, just as the life cycle of a trout goes round and round. Years 3 & 4 have also been thinking of other fish that live in the river. They were so interested that some children even dedicated their break times to generate an alphabetical list. Favourite is Ellis Williams traditional design with modern twist. Wouldn’t be out of place is “Megastructures” Looks like a world class observatory. Links to transport, good access and well thought out. Least favourite is Farrell and Clark – looks like a car park or power station. 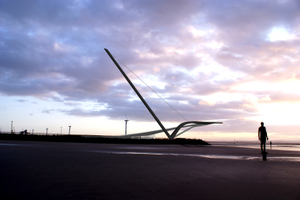 Studio 8 is a nice design but not unique – similar to Marine Way Bridge in Southport. Phos – a variation on the tall phallic buildings we are being subjected to by architects. Duggan Morris – Conceptual design but I feel this would date. In 20 years time this may be the kind of embarrassment the “sandcastle” in Liverpool is. First choice = Duggan Morris whist initially looking like a jug, it appears to be the most pleasing to the eye. Second choice = Ellis Williams. The other three have no appeal to me at all. The most important view should be from those people who have to live with the view [of the structure] all the time. After much pondering I definitely think the Duggan Morris proposal is particularly striking and yet not over imposing. I like the way it appears to rise out of the water as a beacon. It looks very striking illuminated in the diagram. Would really act as an imposing gateway to the River Mersey. Duggan Morris is a quite an acceptable design. Farrell and Clarke, Phos and Ellis Williams I feel would be eyesores. Studio 8 is interesting but doesn’t look very practical. 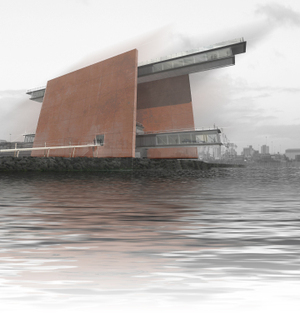 Studio 8 – interesting shape but feel that it blends too much [into the landscape] and won’t be seen from across the river. Duggan Morris – most favourite design. Visually exciting, good facilities, stands out in the landscape without detracting, lots of viewing opportunities, innovative structure to be seen ay and night. Farrell and Clarke – least favourite design. Too severe in the landscape. Appears to close in the space rather than open it up. Phos – A bold statement but perhaps not sympathetic enough with the landscape. Seems to limit views rather than open them out. 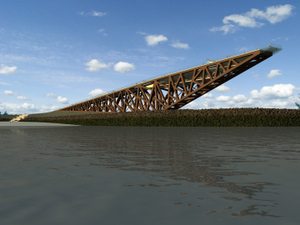 Ellis Williams – like the concept of recreating piers but this design seems too heavy and visually blends in too much. Phos – did the architects only have a set square to design this with? Studio 8 – is this physically stable in high wind. Ellis Williams – perhaps too large or industrial looking for this site. Farrell and Clarke – no. Duggan and Morris – finally a proper observatory. Studio 8 - Are they subliminally appealing for our approval by building a giant tick? The shape of it is very elegant but the size is way too big! I’m not even sure how visitors are supposed to use it. I think the best views would be from a platform that’s too exposed to be used for most of the year. Duggan Morris – Elegant, iconic and individualistic. Of the shortlist this is my favourite – the only one I would travel to see. My only concern is whether it is achievable and affordable (remember Will Alsop’s “Cloud”?). This would also add an unmistakeable recognisable “Welcome to Merseyside” for liner passengers. Farrell and Clarke – This is just ugly. Merseyside has acquired more than enough brutalist slabs in recent years – please don’t build this. The worst of the shortlist. The view from the sea is reminiscent of dockyard cranes – functional and ugly. Liner passengers wouldn’t give it a second glance. Phos – This looks like an odd collection of mismatched ideas. How does a glazed garden sit on top of a rusty box? It manages to combine an odd shape with a complete lack of character. Weathered steel speaks of rust and industrial decline – welcome to Merseyside in the seventies! Ellis Williams – I’ve seen this before – it’s a sculpture on a roundabout in Speke. It may be the most practical of the shortlist – certainly the most accessible – but its appearance is bland and forgettable. It is not an iconic gateway structure. The views may be spectacular and accessible but the structure itself is not special enough to make people want to go there. Hello! We're at the RENEW Rooms in the centre of Liverpool for the second open forum on the Mersey Observatory designs. I'm aiming to log comments from those who come along to meet the steering group. First up is Paul Taylor, vice-chair of Merseyside Residents Network, who lives in Chapel House, the high rise building that overlooks the project site. "Our concern is that there should be more community involvement in the project, both for residents and local businesses - both for the choosing of the design, and once the new Observatory is built - for example, we'd like some input into how visitors will be managed, noise control and so on." "People shouldn't think of it as an isolated or totally new thing in the area. There are 17 observatories around the country, often by the RSPB. I've worked on several, in Cape Clear Island, Ireland, and Ardnamurchan Point, SW Scotland and Lundy Island in the Bristol Channel. They're mainly bird observatories, but they're also used for climate change activities etc. The main problem with them is that they tend to be on 'extreme' access points. But ours will be very well connected. I've recently been to Hull to see The Deep, an aquatic centre and underwater observatory, but that's expensive to travel to from Hull. I'd like to see a free transport link from Waterloo Interchange, maybe a tuk-tuk or rickshaw. I worry about the project becoming elistist or too expensive for local people. It has to be part of an overall plan, so I'd like to see better access to the nature reserve next door and Potter's Barn Park (the monument to the battle of Waterloo). That should help to raise the status of the other local attractions. Maybe it could even form Mersey Observatory and Country Park, and also encompass the cycle and walking paths and access to the Leeds Liverpool Canal, so you've got a choice of attractions. I've spoken to two of the judges, and they were aware of other observatories. It would be useful to have a public event to hear from representatives from them to learn from their experiences, so that the planners here can make sure that our Observatory fits in to its community. For example, the planned Observatory for Malin Head, Ireland has a plan for a community drop-in centre - this observatory should be openly accessible for locals, and part of us." "There's not much evidence of renewable energy sources being used. Has the potential of tidal / coastal energy been explored?" Jenny Andrew and Chris Wilson are two oceanographers who live in Waterloo, close to the site. They're big fans of the entry from Buro Happold. Chris says he really likes the use of hydroelectric power here, especially because you can see the wind turbines and the beach around the Observatory, and the way the building is powered will be able to be easily related to what's nearby. He thinks the garden space is also very apt for a site near a nature reserve. The whole thing would really involve visitors in their environment, both near and far. "After exploring the excellent design proposals, I believe a horizontal approach would be more successful in this particular location. The proposals exploring a predominantly vertical approach are weakened by their poor relationship to the horizontal approach to the pinnacle experience position, and not fully engaging with the site and its surroundings. I believe the Ellis Williams design is an integral experience and entity and is very characteristic of the site." "Phos is the best. It offers good amenities throughout the year, in any weather - has lots of surprise and subtlety. 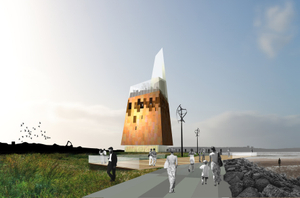 It complements the park and existing icons well - the money would be spent in the right places. The pier is daft - all the money goes into structural gymnastics, and it wouldn't work in poor weather. The entry from Studio 8 would be a waste of resources - all the energy and money in a sculpture, and no facilities at the upper level. It will not work except as a sculpture. [The Observatory] should not compete with the existing landscape, which is already great. The windmills are already the icons of the site, along with Another Place. I think the Farrell and Clark entry is more structure than facility. It would create wind problems too. All the schemes have overlooked the importance of approach and new gateways to the park from South Road and Cambridge Road." Finding out all about trout. Watching the eggs being put into the tank. Will they really grow to be big fish one day? This is what the tanks look like. Easter may be early this year but pupils at three Lancashire schools will be looking after eggs of a different kind. 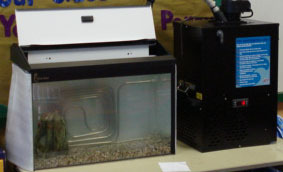 Children at Brabin's Endowed Primary, Chipping, Thorneyholme Primary, Dunsop Bridge and St. Leonard's Primary at Padiham are keeping a watch on newly installed fish tanks in their schools containing sea trout eggs, being part of the Trout-in-the-Classroom scheme promoted and overseen by Ribble Catchment Conservation Trust based at Castle Cement Ltd in Clitheroe. 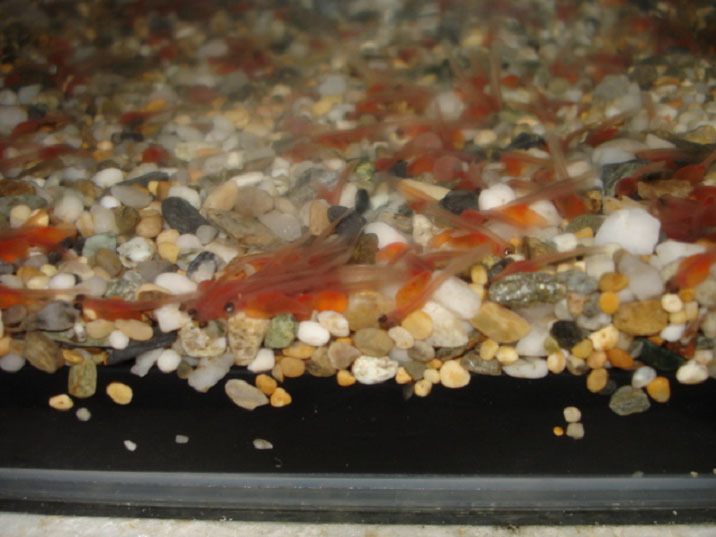 The eggs are starting to hatch and the children will feed the fry before finally releasing them into their local river or stream to increase trout numbers. Said Stephen Hatton, the Trust's Habitat Project Manager, “ The aim of the scheme is to promote a better understanding of the rivers and streams by the children in a very hands-on way and encourage them to look after their rivers and keep them clean and healthy for future generations. Hopefully in years to come they will see adult fish returning to spawn in the very same stream they were released into”. Action Ribble Estuary secured funding for the tanks through Lancashire County Council's Green Partnership Awards and the Environment Agency matched the funds through the Ribble Fisheries Action Plan. The Environment Agency also provided the eggs from local streams. This blog will keep you updated on the fishes' progress and show you how else the children are being involved in this exciting project. If you'd like to meet the steering group, or comment on the designs, why not pop along to one of the open forum sessions: CROSBY LIBRARY - 18TH FEBRUARY, 4.30pm-6.30pm / RENEW ROOMS - 20TH FEBRUARY, 12.00pm-2.00pm / SEACOMBE FERRY TERMINAL - 21ST FEBRUARY, 4.30pm-6.30pm. There'll also be a live blog on this site of the session at the RENEW Rooms on 20th February.